Use this method to compare page text regardless of its visual appearance. It computes page similarity based on text content only and completely ignores text appearance, layout, images and graphics that might be present on the page. It is the best method to detect duplicates in most document types. This method compares pages "as images" and detects pages that look exactly the same. This method does not compare any invisible text that may be present on the page. It is not advised to use this method on scanned paper documents. Quite often this operation is used to find duplicate pages in the scanned paper documents. The scanned documents need to be OCRed prior to using them for any text-based processing. The OCR is a process of recognizing text in scanned documents and making them searchable. It is essential to understand that text recognition in scanned documents is prone to errors and it is rarely 100% accurate. The number of errors depends on scanning resolution and original document quality. In most common cases, a scanned page may contain between 1 to 10 recognition errors where certain letters are incorrectly identified. For example, depending on the font, the lowercase letter l can look exactly like the numeral 1 . The uppercase letter O is often misidentified as the numeral 0, or uppercase letter S as the numeral 5 and etc. Since many alphanumeric symbols share similar, or identical, physical characteristics, differentiation often poses a challenge. This is why a similarity-based comparison comes useful to detect small differences between pages that are produced by the text recognition process. Low quality scanned documents may contain a large number of errors making them unusable for any reliable text-based comparison. See the following tutorial on how to OCR scanned documents and asses their suitability for the text-based processing. .
You need a copy of the Adobe® Acrobat® along with the AutoSplit™ plug-in installed on your computer in order to use this tutorial. You can download trial versions of both the Adobe® Acrobat® and the AutoSplit™ plug-in. This method compares page similarity only based on their page content. The visual appearance, text position and order is irrelevant. This method also ignores any images and graphics present on the pages. The modified cosine similarity metric is used to calculate how similar are two pages based on their text content. Start the Adobe® Acrobat® application and open a PDF file using "File > Open..." menu. Select "Plug-Ins > Split Documents > Find and Delete Duplicate Pages..." to open the "Find Duplicate Pages" dialog. Check the "Compare only page text (ignore visual appearance of the pages)" option. Settings appear below the menu after selecting a predefined parameter set. The text comparison method uses 3 parameters to limit how different two "similar" pages can be. By varying these parameters, it is possible to detect pages that have a different degree of similarity. Minimal allowed page text similarity (in percent) - this is the value of cosine similarity metric expressed in percent. Specify minimum allowed page text similarity between 70 and 100 (in percent). Maximum allowed page length difference (in characters). Maximum allowed page text difference (in words). Use these settings to experiment with processing settings when it is necessary to adjust processing algorithm for a specific document. Select two pages that can be consider identical. The software will auto-calculate page similarity and the statistics will appear in the left lower corner of the dialog. Click "OK" to save the current similarity settings. There are several parameters that control the page content that is being analyzed by the text comparison algorithm. Use these options when comparing scanned paper documents that may contain various text recognition errors. These options exclude certain kind of characters from processing. In many cases, it may help to compute a more accurate similarity metric. Ignore text case - this option ignores text case while comparing text. Ignore punctuation (,.! ?-) - this options excludes all punctuation characters from comparison. Ignore non-alphanumeric characters - this options ignores all characters except letters and digits. Click "OK" to save page similarity settings. The "Delete Duplicate Pages" dialog shows a list of duplicate or near-duplicate pages. Click on a page record to display a corresponding page in the viewer. Examine pages and select/unselect pages for deletion. Optionally, click "Save Report..." to create a page similarity report in HTML format. Or click "Bookmark Pages" to create bookmarks in PDF for selected duplicate pages. Note that the apperance and location of the text do not affect the results. Optionally, use "Bookmark Pages" button to bookmark all checked pages. This is useful if you are not planning to delete the found duplicate pages from the document. Use checkboxes in front of the pages to select/unselect them from the processing set. Use "Extract Pages...." button to extract all checked pages into a separate PDF document. This operation will not remove pages from the current document. Use "Save Report..." button to save page similarity computation report into HTML file. It contains page similarity details, shows differences between pages and lists missing words. It can be very useful for the in-depth analysis. Click "OK" button to confirm. Pages will be permanently removed. Check the "Compare visual appearance for exact match (can be used to compare images)" option. Click "OK" to start searching for duplicate pages. The "Delete Duplicate Pages" dialog shows a list of duplicate or near-duplicate pages. Click on a page record to display the corresponding page in the side-by-side view. Examine pages and select/unselect pages for a possible deletion. Click "Delete Pages" in the "Delete Duplicate Pages" dialog to proceed. Click "OK" button to delete pages from the current PDF documents. Pages will be permanently removed. This operation can be used to find and remove duplicate pages from the multiple PDF documents. The approach is to combine one or more documents into a single PDF file and run “Find and Delete Duplicate Pages” operation on the resulting file. This will essentially produce a single document without any duplicates. 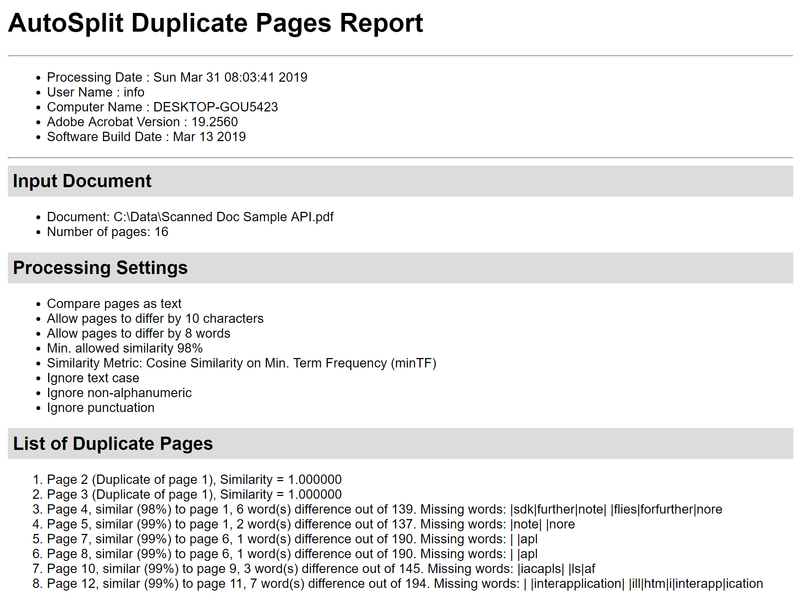 Optionally, it is possible to extract all detected duplicate pages into a separate PDF document. Start the Adobe® Acrobat® application and select "Tools" from the menu. Select "Combine Files" icon from the Tools list. Click "Add Files..." in the "Combine Files" menu and select PDF files to merge for comparison. Click the "Combine" button in the menu to merge selected PDF files. The combined output PDF file would appear on the screen. If not, open the combined PDF file. Check the "Compare visual appearance for exact match (can be used to compare images)" option. Click "OK" to start searching for duplicate pages. The "Delete Duplicate Pages" dialog will show a list of duplicate or near-duplicate pages. Click on a page record to display a corresponding page in the viewer. Examine pages and select/unselect pages. Click "Extract Pages..." to extract selected duplicate pages into a new PDF document. Specify an output folder and a file name. Click "Save" once done. The dialog would appear showing the number of pages that have been extracted into a separate document. Now you have saved all duplicate pages into the separate PDF file before deleting them. You can examine these pages and use later if necessary. Click "OK" in the dialog to delete selected duplicate pages from the current PDF document. The selected duplicate pages would be permanently removed from the PDF document. You would need to use "File > Save" menu to save the modified document to disk.